We can convert all manner of floppy discs to to include ZIP drives. A floppy disk, also called a floppy, diskette, or just disk, is a type of disk storage composed of a disk of thin and flexible magnetic storage medium, sealed in a rectangular plastic enclosure lined with fabric that removes dust particles. Floppy disks are read and written by a floppy disk drive (FDD). Floppy disks, initially as 8-inch (200 mm) media and later in 5 3/4inch (133 mm) and 3 1/2-inch (90 mm) sizes, were a ubiquitous form of data storage and exchange from the mid-1970s into the first years of the 21st century. By 2006 computers were rarely manufactured with installed floppy disk drives; 3 1/2-inch floppy disks can be used with an external USB floppy disk drive, but USB drives for 5 1/4-inch, 8-inch, and non-standard diskettes are rare to non-existent. These formats are usually handled by older equipment. 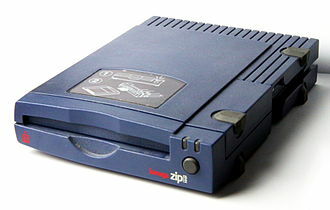 The Zip drive is a medium-to-high-capacity (at the time of its release) removable floppy disk storage system that was introduced by Iomega in late 1994. Originally, Zip disks launched with capacities of 100 MB, but later versions increased this to first 250 MB and then 750 MB. The format became the most popular of the superfloppy products which filled a niche in the late 1990s portable storage market. However, it was never popular enough to replace the 3.5-inch floppy disk. Later versions of the disc matched the capacity available on rewritable CDs but this was far surpassed by the later rewritable DVDs. USB flash drives ultimately proved to be the most popular rewritable storage medium among the general public due to the near-ubiquity of USB ports on personal computers and soon after because of the far greater storage sizes offered. Zip drives fell out of favor for mass portable storage during the early 2000s. The Zip brand later covered internal and external CD writers known as Zip-650 or Zip-CD, which had no relation to the Zip drive.